The remarkable generosity of a Chinese businessman is set to deliver major benefits to eight well-known charities based in the city who work closely with Sheffield United. 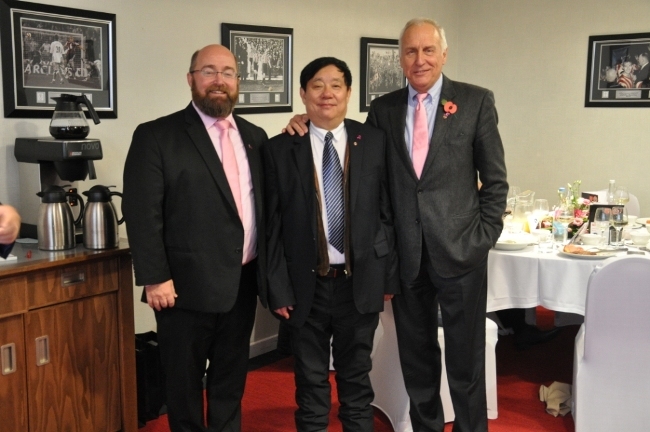 Each is set to receive a generous donation from a substantial sum of money being provided by Wang Chunming as a result of his visit to the Club’s Bramall Lane stadium where he and family members were guests of Co-Owner Kevin McCabe. Mr Wang, chairman and president of Sichuan Guodong Construction Co., Ltd., was accompanied by his daughter Emily and her husband Dylan Liu, both educated in Sheffield and now living in the city. Dylan is Director of UK Investment and Development for Sichuan Guodong. They saw first-hand the Blades’ delivery of an awareness day for Breast Cancer Care and were impressed by the club’s efforts for the charity and its work for the Foundation. As a result, Breast Cancer Care will receive £10,000. Other donations will go to: Sheffield Children’s Hospital; Weston Park Hospital; St Luke’s Hospice; Bluebell Wood Children’s Hospice; St Wilfred’s Residential Home Appeal; Neurocare and the Sheffield Cathedral Archer Project. All are either supported by Sheffield United and/or Scarborough Foundation – the McCabe Family Charitable Trust. The news follows Sheffield City Council announcing a major new investment partnership with Sichuan Guodong Construction Co Ltd, one of the largest companies in Sichuan Province. The Council, and Sichuan Guodong Construction Co Ltd, have agreed a framework for the development of a long term strategic alliance for investment in Sheffield. Sichuan Guodong Construction Co Ltd is based in Sheffield’s sister city Chengdu, and is worth over one billion pounds. The memorandum of understanding outlines plans to facilitate investment in Sheffield and the wider City Region by the Sichuan Guodong Construction Co Ltd. This arrangement has been supported by UKTI’s Regeneration Investment Organisation (RIO). Mr Wang said: “Being based in Sheffield’s twinned City of Chengdu, I am delighted that through Mr McCabe and the City Council, my Company Sichuan Guodong Construction can support the wonderful charitable work being undertaken by Sheffield United FC. I very much hope the contributions will have a progressive impact for each of the selected Charities and also to the Community of Sheffield. Sichuan Guodong Construction Company is based in Chengdu, where its twinning with Sheffield was organised by Mr McCabe via Sheffield United FC back in 2005. Sheffield City Council enjoys a working relationship with the city of Chengdu promoting closer ties between the cities. Thousands of students from China benefit from further education in Sheffield. Representatives from Sheffield City Council, who work closely with both Sheffield Universities, the Blades and the Scarborough Group to promote Sheffield in China (and Chengdu in particular), introduced Mr Wang to Mr McCabe which led to him being hosted by Sheffield United. Mr McCabe and other colleagues from Scarborough Group International and Sheffield United FC are in Chengdu later this month to discuss further initiatives with Sichuan Guodong Construction Company and Mr Wang.